Prasolov, V. and Solovyev, Y. Providence, RI: Amer. Math. Soc., 1997. Akhiezer, N. I. Providence, RI: Amer. Math. Soc., 1990. Bowman, F. New York: Dover, 1961. In its first six chapters, this text presents the basic ideas and properties of the Jacobi elliptic functions as a historical essay. Accordingly, it is based on the idea of inverting integrals which arise in the theory of differential equations and, in particular, the differential equation that describes the motion of a simple pendulum. 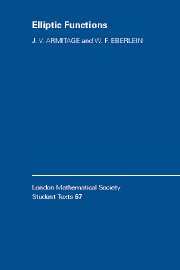 The later chapters present a more conventional approach to the Weierstrass functions and to elliptic integrals, and the reader is introduced to the richly varied applications of the elliptic and related functions. Show that if a doubly_ periodic function with periods 2w1,and 2w3 is even , then its derivative vanishes at z= w1, w3 , and w1+ w3 .